More often than not, donations are the lifeline of nonprofit organizations. They are pivotal in furthering your impact and ensuring financial sustainability. A number of factors contribute to creating a solid donation base for your nonprofit. 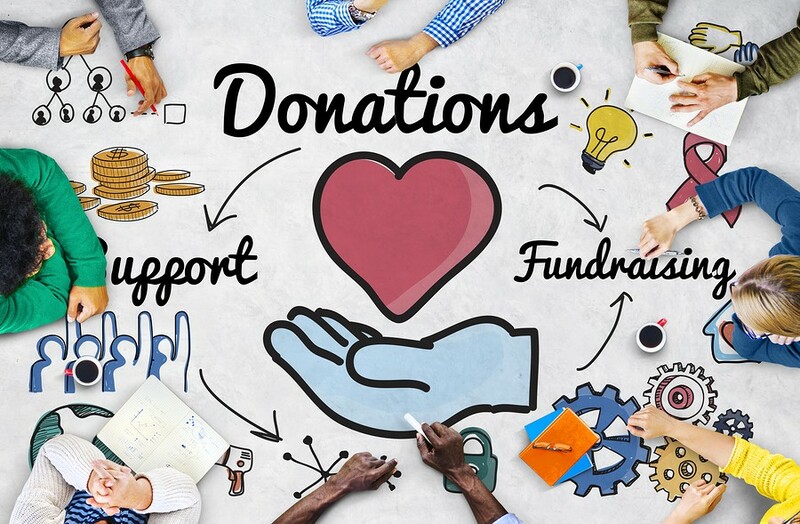 From attracting new donors and building relationships with current ones to thanking donors and maximizing the donation size – there are many steps you should be taking to keep the donations flowing into your nonprofit. Arguably, optimizing your donation page is one of the most important ones. Very often, a donation page is a nonprofit’s worst enemy when it comes to fundraising. If a donation page is disorganized, difficult to navigate, overwhelming or confusing, it defeats its own purpose: increasing donations. Your website can accomplish a variety of goals, but your donation page should seek to accomplish only one: a steady stream of online donations. If you succeed to follow the simple guidelines outlined below, then you are likely to increase the amount you can raise online via your donation page. 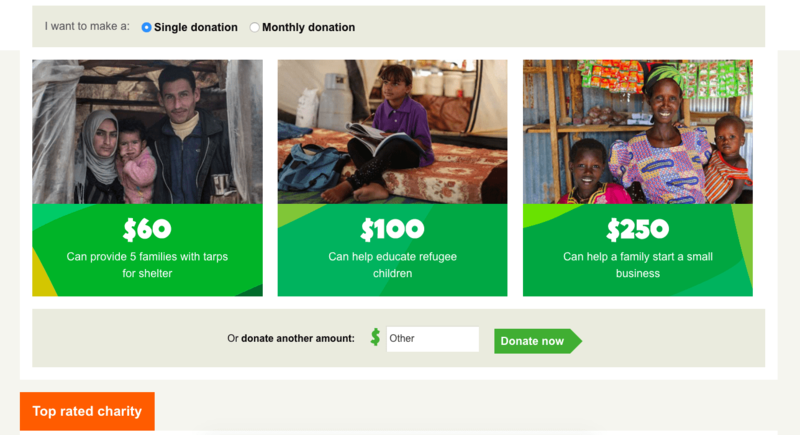 Why do Great Donation Pages Matter? Online giving grew 7.9% in 2016 and has seen consistent year over year growth. An online donation page probably shouldn’t be your only path to accepting donations, but it should be an important part of a holistic fundraising strategy. A conversion rate looks at the percentage of unique donation page visitors that complete the transaction. If you get 1,000 visits to your online donation form and 1% convert into donors, you’ll have 10 donors. If you get 1,000 visits to your online donation form and 3% of them convert into donors, you’ll have 30 donors. That’s a growth that shouldn’t be disregarded. Unlike many other forms of donating (via a phone call, mail, or at a fundraiser event), donation pages are highly shareable. This makes them ideal for increasing your reach, and therefore the number of donations. 1. Make Sure Your Online Donation Page is Easy to Find. Regardless of how well-designed and functional your donation page is, it won’t matter unless your donors can find it. a. Ensure donation links/button are easy to find. A donor should be able to find your donation link within a couple of seconds of your donation page loading. A good case practice is to place the link on the top navigation found in the website’s header. Highlight this button/link, potentially by using a bright and eye-catching color. By placing an attention-grabbing “Donate Now” button on your website, you’ll increase the chances that supporters will get to your donation page. b. The donation link should lead straight to the donation form. When a donor clicks the ‘donate’ link/button, they should be immediately taken to the donation form. A common mistake is to insert a variety of other explanations or text in between those two stages. Although that usually comes out of a good intention (to inform donors of other ways to get involved or donate), any additional step lowers the conversion rate. Even registering or solving captchas before donating lowers the conversion rate. c. Your call to action should be everywhere. In order for donors to find your donation page, calls to action should be included in any and every communication towards your target audience i.e. emails, social media posts, videos. For nonprofits, calls to action are almost always donation calls. Strategically place donation calls throughout your website. 2. Include a Compelling “Why”. Not every visitor to your website visits with the intention to give. Most have to be persuaded. Having a brief, but enticing and compelling “why” helps with the convincing. Your donation page shouldn’t feel like purely a payment processing form. Since 1961, we’ve helped free over 50,000 people who have been unjustly imprisoned. Together we’ve brought torturers to justice, we’ve exposed the truth about human rights violations, and we have made those in power change their ways. Dreams are universal. Opportunity is not. By lending as little as $25, you can help people around the world create opportunity for themselves and their communities. 3. Use a Fundraising Software for Your Donation Page. Pre-filled custom amounts with descriptions to let your donors feel great by knowing what they’re contributing to. Recurring giving options. Place a recurring giving option on your form to see higher donor retention rates. Optimization for desktop computers, mobile phones, and tablets. Accepting donations on your Facebook Page. Donation ‘thermometer’ to encourage more donations. Check out the Donorbox solution to donation pages! 4. Customize Your Donation Page. Building a brand takes time, work, and patience. And your donation page is an extension of your brand. Having your donation page branded and aligned with the rest of the website builds trust and credibility and increases the likelihood that the visitor will convert into a donor. 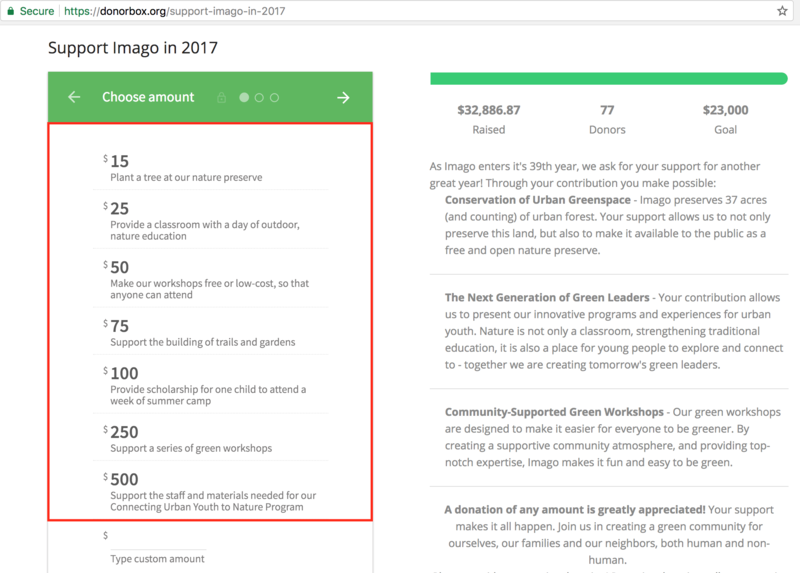 Consistent branding not only makes your donation page look better, it also shows your donors that their donations are going to your organization, not just a random donation page. Custom-branded donation pages on a nonprofit’s website help raise up to 6 times as much money on average. Bonus tip: Visually appealing donation pages are becoming increasingly important, especially to younger donors. 75% of young donors are turned off by out-of-date websites. 5. Optimize Your Donation Page. Your donation page should be mobile-friendly/responsive. This means the donation page will resize according to the device being used, allowing for optimal viewing. Our smartphones are becoming an increasingly popular way to connect, share, access information, and donate, and we have started expecting optimized pages when donating. From NP Source, we learn that by 2018, mobile devices will account for 57% of all Internet traffic. In the past year, mobile giving donations have increased by 205%. 51% of people who visit a nonprofit’s website do so on a mobile device. By incorporating mobile-responsive design, nonprofits can increase their donations by 126% on average. If a visitor becomes frustrated when attempting to make a donation to your organization via mobile device, chances are good that they will leave your site without giving. 6. Pre-select & Display Donation Amounts. The donation amounts should stand out on the page. There should be no distraction around this area, leaving your donation form the space to shine. It is generally recommended to provide your donors giving levels, allowing them to decide how much they are willing to give. Donor retention rate is one of the most important metrics for a nonprofit. Recurring donors are incredibly valuable to nonprofits. Not only do most donations trickle in from existing donors, but gaining new relationships is always more costly than cultivating existing ones. While there are numerous best practices for boosting donor retention rates, one of the easiest is to offer recurring donations as an option on your donation page. Very few donors will log back on to donate every month, which is why automating the process makes all the difference. 8. Offer Different Payment Options. Giving donors different ways to make their donation is vital to enhancing the donor experience. Outlining all of the payment options you accept will make giving more convenient for your donors because they’ll be able to choose the option that’s the most suitable for them. The more options you provide, the more donor preferences you’ll accommodate. This, in turn, increases the likelihood of them donating. On your form, list out all of the payment methods that your nonprofit can accept. 9. Keep it to One Page. In order to keep the donor experience simple and straightforward, keep your donation page to one page with as few required fields as possible. The easier the process, the more likely a donor is to see it through to the end. If a one-page donation form isn’t possible, be transparent about how many pages there are. 10. Keep it Simple and Clear. 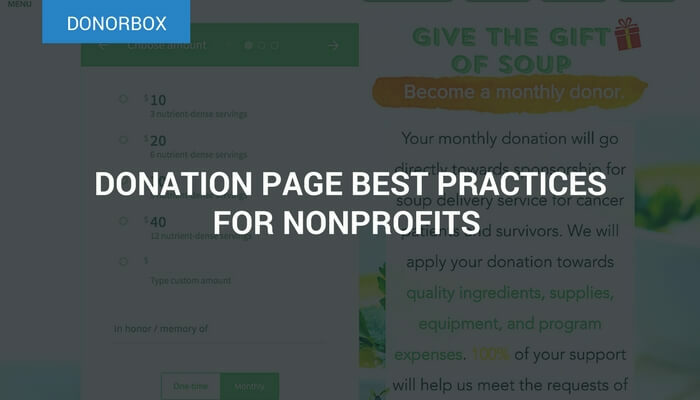 Probably the most important tip out there, it emphasizes that your nonprofit’s focus should not only be on directing possible donors to your donation page, but also providing them with a clear, simple, and exciting donor experience. And remember, every extra step is another chance for the donor to get distracted or second-guess their decision. 11. Your Nonprofit’s logo should be clearly visible on the banner. This reinsures the donor that they are giving to the right organization. The logo provides safety and security for visitors. 12. Pay attention to the title. Your donation page title should indicate the content of the page. Keep it short, engaging and make sure your keywords are towards the beginning (for SEO purposes). 13. Menu or no menu? A lot of nonprofits opt for including the menu/navigation in order to provide visitors more information about their nonprofit and other ways to get engaged. However, the menu can distract visitors and take them elsewhere on the website. Consider not including a menu on your donation page. 14. A picture is worth a thousand words. Humans are visual beings. Your donation page should include captivating images that are high-quality, powerful, and visually appealing. 15. Your URL should start with https. Your nonprofit donation page URL should be short and compelling and contain your focus word. Very importantly, it should start with https. The “s” at the end of the http stands for SSL and allows all confidential information (e.g. credit card numbers) to be safely transmitted. Knowing their information are secure, visitors are more likely to donate. 16. Be mindful of the “fold”. This is the space your visitor sees without scrolling. All essential information should be placed within this area. Nonessential information should be placed towards the bottom of the page. This way the visitor doesn’t have to scroll down to search for crucial information (which can distract from donating). 17. Disclose how donations are used. 63% of donors want to know how their money will be used by nonprofit organizations. Clearly define what percentages of your organization’s donations go to research, treatment, education, administration, etc. Or, if you use giving levels, tie each donation amount to a tangible gift. 18. Have a “thank you” page. With so much focus on the donation page, many nonprofits forget to create a “thank you” page. This is the page the donor will be redirected to after making a donation. Thanking your donors is one of the most important elements of donor retention, and should not be skipped. Bonus tip: You can also automate receipts, so donors will always be certain that you’ve received their gifts. 19. Offer a “share” option. Alongside the “thank you” page, it is vital that your nonprofit encourages donors to share the page on social media, invite friends to donate and provide other resources for donors. 20. Provide information on other ways to give. Including information about other ways to give will result in higher levels of donor engagement. Involving donors across multiple initiatives is also a powerful way to increase the donor retention rate. This gives your donors choice and flexibility, which increases the chance of them getting involved. Be careful about this not distracting from the main donation call. Here are some of the best case practices when it comes to designing powerful and effective donation pages. The donation page communicates the donor’s impact with real numbers on the right-hand side of the donation page so that visitors know exactly how their gift will be used. 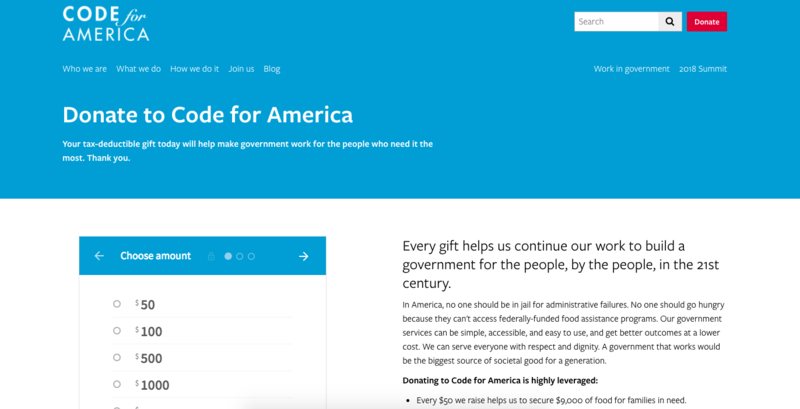 Code for America clearly communicates the ‘why’ at the top and thanks the donors. The page is also relatively clean and straightforward with a simple header and no sidebars. Includes an easy step-by-step process and buttons that improve the donor’s user experience. Although there is information on other ways to donate (giving through a workplace, giving through a donor fund, donating by mail or phone), that information is placed at the very bottom of the page. The focus remains on donating here and now, via this donation page. The page features powerful images and multiple giving options ($60, $100, $250). It also displays top reviews, building the trust for their organization. Their donation page is very minimal, which eliminates distraction. The donation popup keeps the visitor focused on donating. The link/button for visitors to learn more about other ways to get involved is quote inconspicuous, but the opportunity is still there. 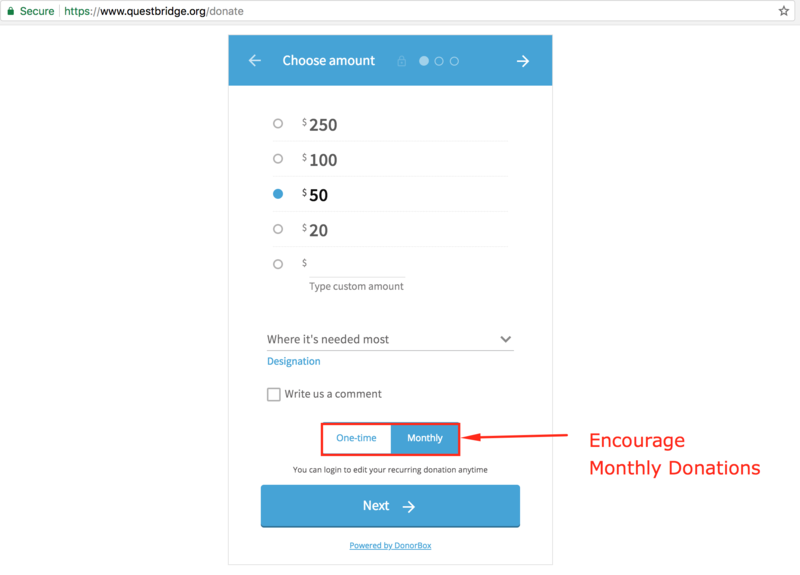 Questbridge provides their visitors with user-friendly buttons and a simple payment section that doesn’t clog up the page with excess boxes or information. 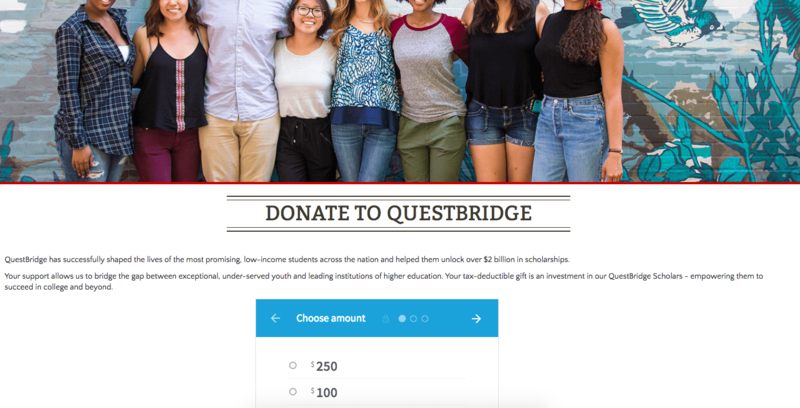 With very little extra information on their donate page, Questbridge keeps their visitors focused on donating. While there are a lot of ways to improve your donation page and encourage visitors to make a donation, one thing is clear: simplicity trumps all when it comes to donation pages. Implementing the tips above will ensure that your donation page is impeccably designed and offers a seamless donor experience. That way, it has the potential to engage visitors, make them believe in your cause, and drive donations – thus allowing your organization to more effectively fulfill its mission.